1 The volunteer run Bluebell Line was the UK's first preserved standard gauge passenger railway, re-opening part of the Lewes to East Grinstead line of the old London Brighton & South Coast Railway in 1960. 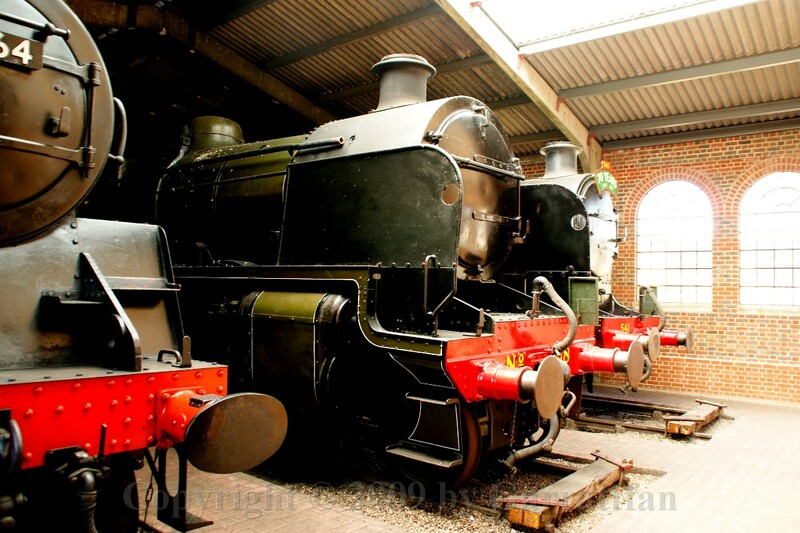 Since then it has developed into one of the largest tourist attractions in Sussex, yet it still remains true to its objectives of the preservation for posterity of a country branch line, its steam locomotives, coaches and goods stock, signalling systems, stations and operating practices. 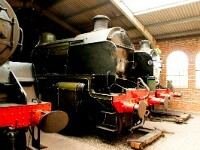 2 Sheffield Park is the headquarters of the railway and home to the Locomotive Department. The station opened in 1882 at the request of the Earl of Sheffield, a local landowner and promoter of the The Lewes and East Grinstead Railway Act 1877 which authorised the construction of a line from East Grinstead to Lewes. The line was closed in 1958. 5 When I arrived the first train of the day was ready for departure. 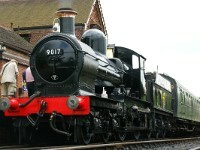 In front the former GWR Earl/Dukedog No.9017, "Earl of Berkeley". Nicknamed "Dukedogs" since they were an amalgamation a Bulldog and a Duke, the parts of this loco are thus actually older than the "building" date suggests. The 1938 rebuild of 3217 used the frames from "Bulldog" No.3425 (built 1906) and boiler and cab from "Duke" class No.3282 (originally named "Chepstow Castle" and built in 1899). 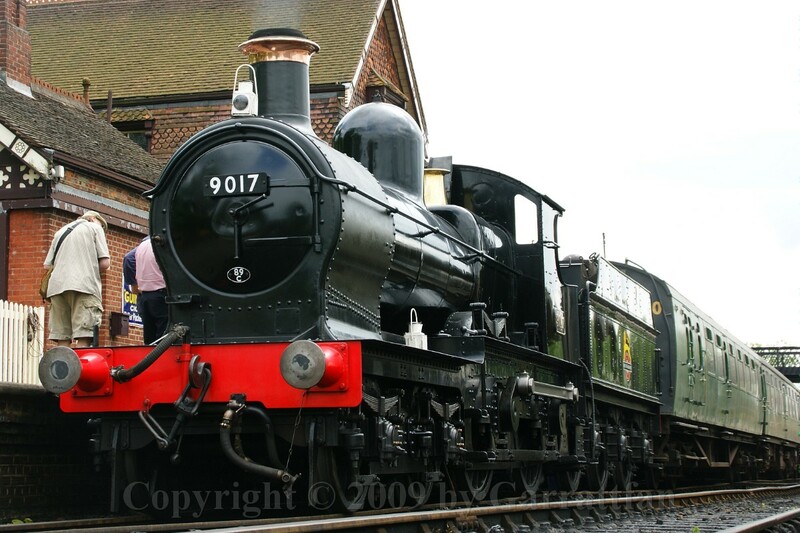 A few of the class carried the names of Earls, but 3217 did not receive its allocated name until preservation days. At the time the Earls in question indicated to the GWR that, if their names were to be used, they would prefer their names on something a little more prestigious, and so they were transferred to new Castle class locomotives. This class of locos was widely used on the Cambrian lines. At the time this loco was saved for preservation the Bluebell was the only line where it could run, and it has been in Sussex ever since, apart from a few years spent at the Great Western Society, at Didcot. The identical "West Country" and "Battle of Britain" pacifics were built to provide increased power for use on the Southern's secondary main lines, especially those in the West country with weight restrictions. However, some of Bulleid's novel ideas, designed to reduce maintenance costs, proved troublesome. Therefore in 1957 a programme of rebuilding the locomotives along conventional lines was started. The rebuilding of the Bulleid light pacifics added several tons to their weight, but produced, to all intents, brand-new locomotives, whilst retaining the distinctive light-weight Bulleid-Firth-Brown wheels and his superb free-steaming boiler, along with many other of the successful innovative design features. 17 The impressive light weigt yet strong Bulleid-Firth-Brown wheels, very much akin to the more known Boxpok wheels in the US. Advanteges of these wheels over traditional spoke wheels: better balance and more uniform supprt of the wheel tyre. Disadvantages: heavier and restricted maintenance access to axleboxes and springs.